Have an Idea!! Where to start? Amazing. This place is amazing. If you like dosas, you’re gonna love this place. 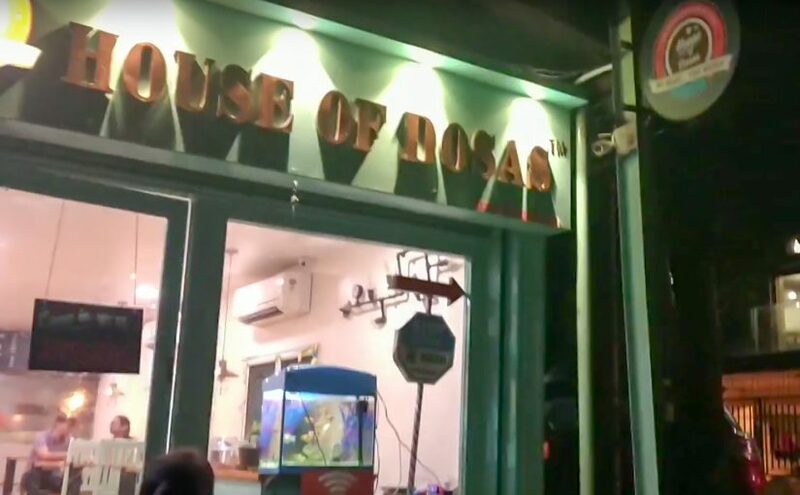 Located in Banjara Hills (Hyderabad), quite close to RK Cineplex, ‘House of Dosas’ makes a perfect hangout destination after a movie at PVR. Just as you enter, you’ll notice that this is one cozy place with very nicely and creatively done seating arrangements. There are table and chairs for groups on one side and high chairs and long table (like those found in bars) on the other. Just as you lift your eyes up the seating arrangement, you’ll notice a large number of colorful post its on the walls adding to the ambiance of the place. These have supposedly been put up by customers giving their reviews, recommendations, suggestions or just making a mark on the wall putting their names with their loved ones. Then there’s an open kitchen at the other end of the restaurant, so you can see as the deliciousness is being cooked. I went to this place after my visit to PVR the other day. The plan was to take a small bite here and then take a wholesome meal somewhere else. But then after eating a bite here, we just couldn’t stop eating. We gave a start with the Podi dosa, this was the first time I was eating one. The dosas and chutneys were served in nice custom made plates and bowls. It looked like they were made out of some form of paper. Just above the table there were lamps hanging from the ceiling, making it look even better. Then we just kept eating more and more, ordered another Podi Dosa, then a Pizza Dosa, and then an Erra Karam Dosa, then…. To add a cherry on top, we had a Coconut Ice Cream from another shop nearby called House of Pops. Just after we were done eating, the owner of the place approached us. He appeared to be a nice, down to earth and a humble person. He told us about how he started the restaurant, how much effort he’s putting to make it an awesome place, which it is. He talked about everything from his financial to sentimental attachment to his business. Basically he talked a lot. But then we had to leave and get back to our place as it was already late night. All in all, it’s an awesome place with yummylicious food and reasonable prices. Worth at least a visit if you’re at Hyderabad, or happen to visit anytime.